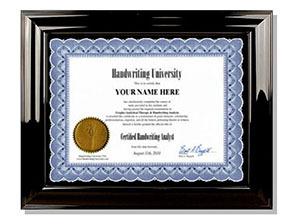 Ready to Become A Certified Handwriting Expert? Yes! Enroll me now. I want to get instant access to the International Home Study Course today and start learning today through the 17 module online training center. Yes! Give me access to the brand new totally updated Video, Audio, and interative website which contains very latest certification level seminar training material. Yes! I realize this includes the actual texbook and 21 tests shipped to my door and 100% instant online access. I want to see my name on an official "Certification" which I can hang on my wall for years to come upon graduattion. Yes! Give me the ability to download all 24+ hours of audio and video content from the training site onto my computer. Also, send me the videos on a 16 GB flash drive, so I can watch and learn anywhere I go (without internet). Yes! 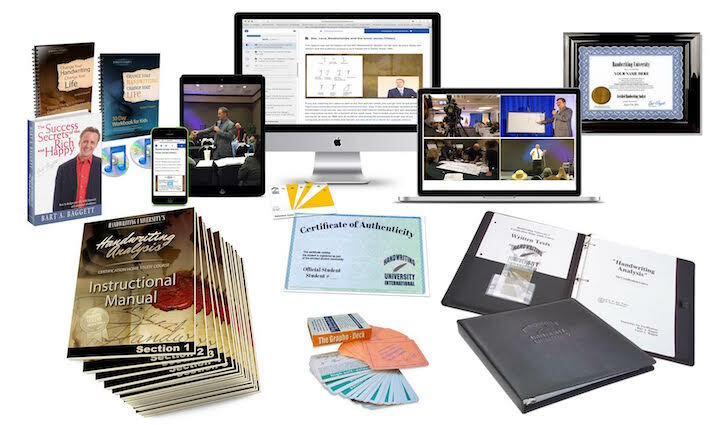 Give me instant access to the 2019 online training area which features brand new videos, quizzes, and course updates which are not on the old fashion DVDs. Yes! I realize I have an iron-clad money-back no questions-asked guarantee. Let me check it out risk-free! Guarantee you pass your final exam with the help of an authorized mentor. Choose one of the following payment options (International orders may be subject to pay extra for shipping, customer service will contact you if needed). We have a shipping center in the USA and India. One easy payment using any major credit card on this secure website. Use this button for single pay option and avoid all financing fees. Call our India or USA office to discuss financing. Want Some Personal Tutoring & Get Personal Life Coaching, too? We now have Authorized Trainers worldwide who are standing by to be your personal guide through the entire curriculum and even help you prepare for your final exam. You choose your Authorized Mentor from our Directory of Authorized Mentors once you are enrolled or we will recommend one based on your native language, learning style, and location. any major credit card on this secure website. You get 6-12 months of live zoom/skype/ telephone tutoring. Most teachers recommend 30 minutes per week for 6 months. Our faculty commitment is not based on time... it's based on the result of getting your certified! Brianna 1 pm-7pm California Time.